They believe that, if this new algorithm is used to its full potential, it could reduce the amount of antibiotics prescribed to these children by as much as 10%. The work is published in The Lancet Respiratory Medicine. Primary care practitioners such as GPs are responsible for 80% of all antibiotic prescriptions in the UK. Around half of these are for RTIs, despite their effectiveness in treating RTIs having been shown to be limited. 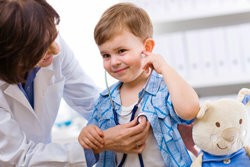 Cough with RTI in children is the most common problem managed by GPs and primary care nurses in the NHS. GPs and nurses find making decisions about prescribing antibiotics in children with RTIs difficult. On the one hand, the over-prescription of antibiotics is recognised as a serious concern but on the other, they want ensure adequate treatment of a significant infection. Led by researchers from the Centre for Academic Primary Care at the University of Bristol, the research team found seven characteristics that can be used to identify children with cough and RTI at very low, normal and high risk of future hospitalisation: short (≤3 days) illness; high temperature; age (<24 months); recession; wheeze; asthma; and vomiting giving the mnemonic ‘STARWAVe’. If children have one or none of these symptoms, there is a very low risk of future hospitalisation; if three or more are present, there is a higher risk they will be hospitalised for their RTI in the following 30 days. More than 8,390 children from 224 GP practices around the UK took part in the study. Among all the children in the cohort, there was a 1% (or 1:100) risk of a child being hospitalised for their RTI in the following 30 days. If a child had none or just 1 of the characteristics, the risk of hospitalisation fell to 0.3% (or 1:300). This then increased to 1.5% (1:66) if the child had 2-3 symptoms, and quickly increased to 12% (1:8) if the child had 4 or more. GP Alastair Hay, a Professor of Primary Care at the CAPC, led the research. He said: “We believe use of this algorithm could represent a step-change in the care of children with coughs and respiratory tract infections in primary care. We all know we need to curb the excessive use of antibiotics, but safely reducing prescribing means improving our identification of the patients who do and don’t need them. This research was carried out as part of the 5-year ‘TARGET’ programme and included researchers from University of Southampton, Imperial College London, North Bristol NHS Trust, Public Health England and University of Washington in the US. The programme, funded by the National Institute for Health Research Programme Grants for Applied Research Programme, was intended to give clinicians the tools they need to better care for these patients.